This is the big chess set that have stand on the wooden chess board which in wide enough for those pieces. 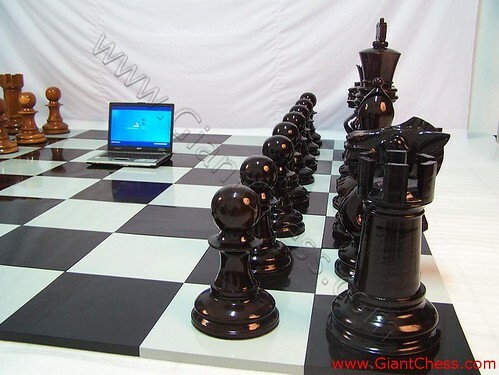 It very interesting to use it for outdoor chess game with your friends, children and family member. By using this big chess set, you can enjoy your chess at garden, backyard, camp area, beach and another interesting object. Those are easy to move even in big size. You just need flat area to lay the chess board and the game can start. You do not need to worry to use it outdoor or even left it at your garden for months, because those chess pieces and board are made from best quality of Teak wood. We choose the Teak wood as our main material, because this kind of wood is the strongest wood in the world for any seasons and weathers. Get it now and enjoy your outdoor game using big chess pieces and wide board.